Helping the environment and saving money is easier than ever². 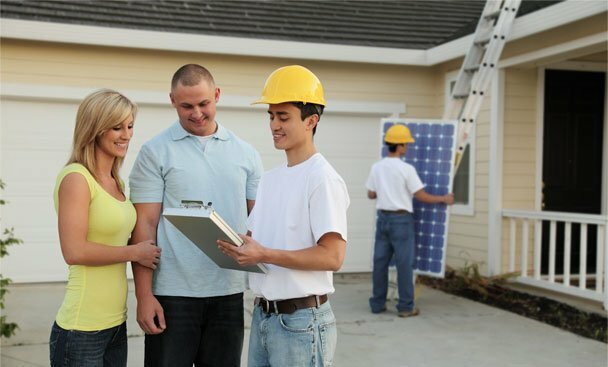 Go solar with one of our preferred installation partners and receive $300 Cash Back. Plus, enjoy security against the potential of rising energy costs. Fill out the form below for your free consultation today. Welcome to Savings Powered by the sun. We believe homeowners deserve to choose where they get their electricity. NRG offers a way to power your home using energy from the sun and protect yourself from potential rising energy costs in the future. Let us introduce you to our preferred rooftop installers and you can see how easy it is to install panels on your home. The best part is that for using one of our partners, NRG will send you $300 in cash back¹ after your complete your installation! Let NRG get you in touch with the experts. NRG has partnered with local preferred rooftop installers to bring you an easy solution to putting solar panels on your home. These installers are people who live and work in your area. They understand your community's unique needs and will help you to make informed decisions about what will work best for your home and future. And remember, when you make the choice to go solar, you're doing more than generating clean electricity. You're making a statement about how you see the world - a responsible choice to join a community that's looking to the future. Why wait? You could be producing your own sun powered electricity in as little as 3 months. Complete our no-obligation form below to request your free solar consultation today! *By clicking the “Get a Free Assesment” button above, you authorize NRG Home and its solar installation partners (21st Century Power Solutions, LLC, Standard Energy Solutions, LLC and/or Sustainable Energy Systems, LLC) to contact you for marketing purposes at the telephone, email address or mobile number you entered using automated telephone technology including auto-dialers, pre-recorded voice messages and text messages, even if your telephone or mobile number is currently listed on any state, federal or corporate “Do Not Call” list. You also authorize NRG Home to share your contact information and monthly electricity consumption (if applicable) with one of the above-listed solar installation partners for purposes of developing a proposal. You are not required to give your consent as a condition of purchase. ¹ Terms and conditions apply to Solar Reward. To be eligible to receive the $300 reward, you must be enrolled in an NRG Home electricity supply product when the preferred partner informs NRG Home your solar system has passed final inspection. ² NRG Home does not guarantee energy or bill savings if you choose to install solar panels with a preferred partner. Savings, if any, will vary depending on solar system agreement pricing versus applicable electricity rates, as well as solar system size, your usage, available incentives and other factors. This is a referral program for which NRG Home may receive compensation from its preferred solar installation partners. Solar installers are not affiliated with NRG Home, its parent company, or any of its affiliates.